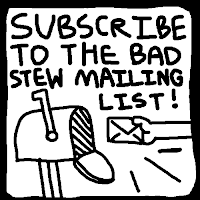 As much as I love Bad Stew, limitations arise from a weekly schedule and the aim to collect the comics in a cohesive book. form. And since time is limited, decisions have to be made. subscribing to the mailing list! •The Catalyst will be completed. It's my longest story yet, it's very dear to me and I think you're gonna like how it all wraps up. third and final volume of comics. Thank you to everyone who looks at or reads my stuff! It means a lot to me.